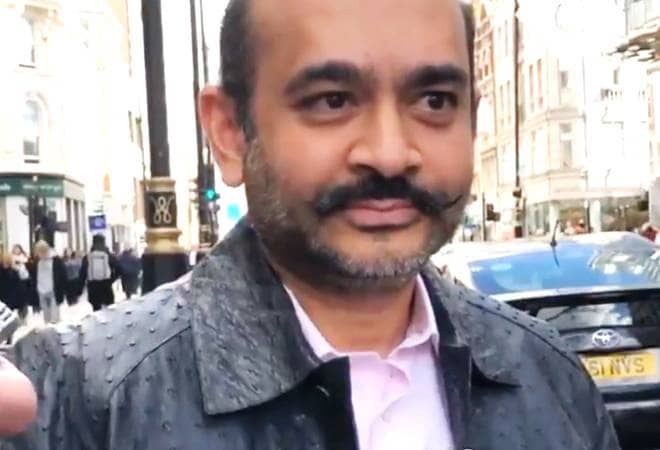 In a surprise to investigating agencies like the CBI and ED in India, Nirav Modi was spotted roaming in London on Friday. While there are several cases of fraud lodged against the former celebrity designer back home in India, he did not seem even a little perturbed when a UK-based newspaper journalist confronted him and tried to ask some relevant questions. Nirav Modi, who is accused of defrauding the state-owned Punjab National Bank (PNB) with over Rs 13,700 crore, lives in a property worth over 8 million pounds (over Rs 72 crore) near Oxford Street in London's West End, at a time when the Interpol has issued a Red Corner Notice (RCN) for his arrest after India's request. The revelation regarding Nirav Modi's whereabouts has been made by London-based the UK Daily Telegraph, which published a report along with a video interview with the former Firestar Diamond boss. The report titled as 'Exclusive: India's most wanted man Nirav Modi - accused of 1.5 billion pound fraud - living openly in London' says Nirav Modi has been given the Nation Insurance Number, which allows him to do business in the UK. In the video, Nirav Modi seems to be politely declining to comment on every question posed by the reporter. Soon after he was tracked by the reporter, he started to flee from the spot while evading the questions. Nirav Modi appears to have gained some weight and sports a handlebar moustache along with grey beard. As per media reports, he might have also undergone plastic surgery in order to evade arrest. Nirav Modi is living at a luxury skyscraper, Centre Point off Tottenham Court Road, on the posh Oxford Street, reported the daily. However, there's no confirmation if he lives in a rented apartment or a purchased property. The CBI had moved an extradition request to the UK authorities in August 2018 after it was confirmed that Nirav Modi was in Britain. In a mail, the UK authorities had confirmed his presence after the CBI sent a diffusion notice to the Interpol regarding the celebrity jeweller. After a year of hiding, Nirav Modi has now reportedly settled down with a diamond business of his own in Soho area near his flat. As per the newspaper, he has registered his diamond business as 'wholesale trade and retailer in watches and jewellery', which is linked to his address on the Oxford Street locality. "The Telegraph has also learnt from a well-placed government source that, Modi was given a national insurance number in recent months by the department for work and pensions and has been able to operate online bank accounts in the UK while wanted by India authorities. He has also been in contact with a wealth management company based in west London, which specialises in advice to rich foreigners," stated the newspaper. There is no clarity on the fact that why Nirav Modi was given the national insurance number, which allows people to work, by the UK government, knowing well that the Interpol had issued an RCN against the fugitive businessman. Nirav Modi and his uncle and partner Mehul Choksi are being investigated by the ED and the CBI after it was detected that they allegedly cheated the Punjab National Bank of over Rs 13,700 crore with the purported involvement of a few of its employees. Choksi, meanwhile, has also settled in the Caribbean island nation of Antigua and Barbuda. Despite efforts, the government has so far failed to get him extradited to India. The UK's Crown Prosecution Service (CPS) had informed India in June 2018 that it could initiate extradition proceedings against Nirav Modi, but no action has been taken so far. One of the many reasons for this could be strict data protection laws in the UK. Though India had revoked passports of both Nirav Modi and Mehul Choksi in February 2018, they allegedly kept on travelling to different countries on multiple Indian passports, with his last documented exit from the UK in March 2018 by air to Paris. It remains unclear exactly how many passports Modi has been travelling on in recent months. Of the total 29 extradition requests sent by India, the UK has accepted 20 such applications in the past 16 years.